It's a long holiday weekend in the UK and there are some offers on for the next couple of days so it's very timely for my sponsor choices for this month. Here's my favourite four from Eternal Maker and Plush Addict. Eternal Maker is offering 10% discount online with BANKHOLIDAY10 code at checkout. Flower Garden by Pikku Saari for Kokka. Double gauze and the prettiest, bright, floral print. works well for simple garment shapes and quilts. Rustica Chambray in Black, Robert Kaufman 150cm/56", 59% cotton 41% linen. I have some of this in black. 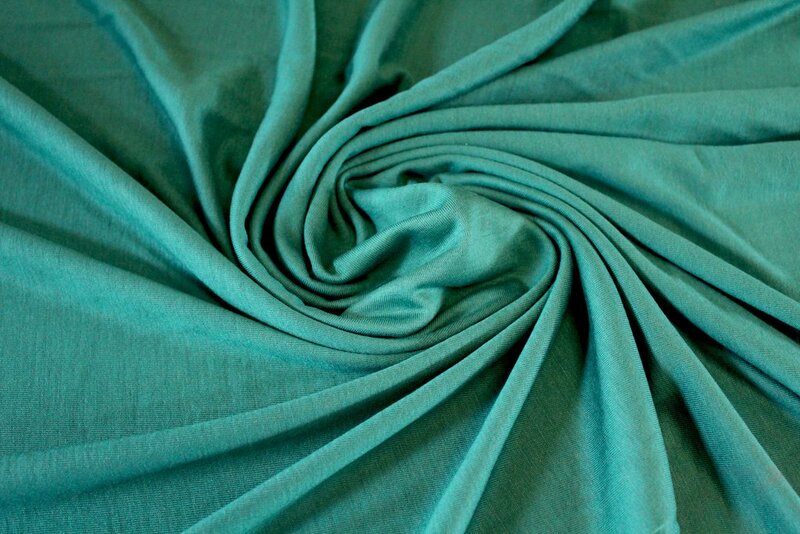 It looks like denim as it has a twill weave but it's much softer, lighter weight and more drapey. Good for dresses, trousers and shirts. Meersburg Birds, Lady McElroy Cotton Lawn 140cm/54" wide, silky cotton lawn with a rainbow selection of birds printed on it. Lovely for dresses, shirts of tops. Plush Addict has a series of accumulator style discounts - the more you spend, the more you save- see here for details, e.g. when you spend £20, save £2- 10% off. Automatically applied at checkout. Dashwood Studio Eden Pop FQ bundle. 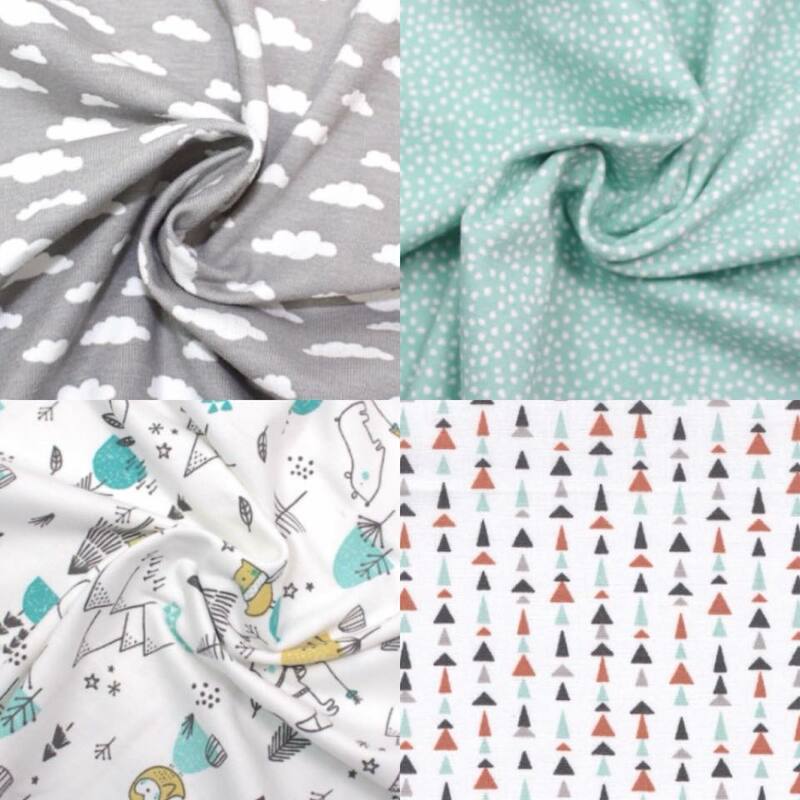 Jilly P has designed this lovely collection inspired by a visit to The Eden Project. 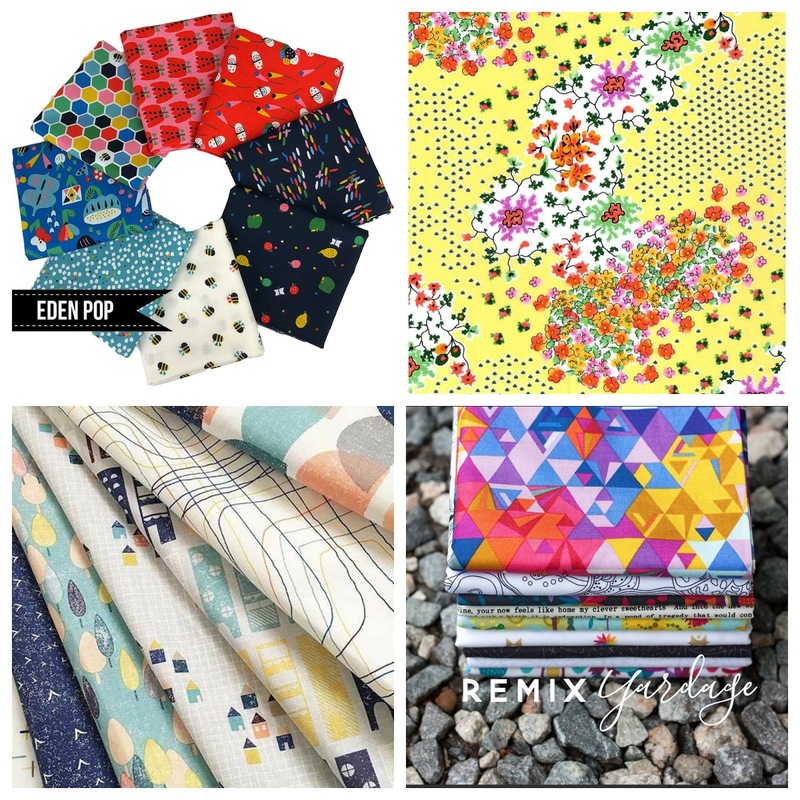 Vibrant and colourful pop-style nature prints. Cotton Lawn, floral on Pale lemon. 142cm/56" wide. Pretty vintage style print on cotton lawn. Alison Glass Remix. Greatest hits style print selection mixed with Sunprints. 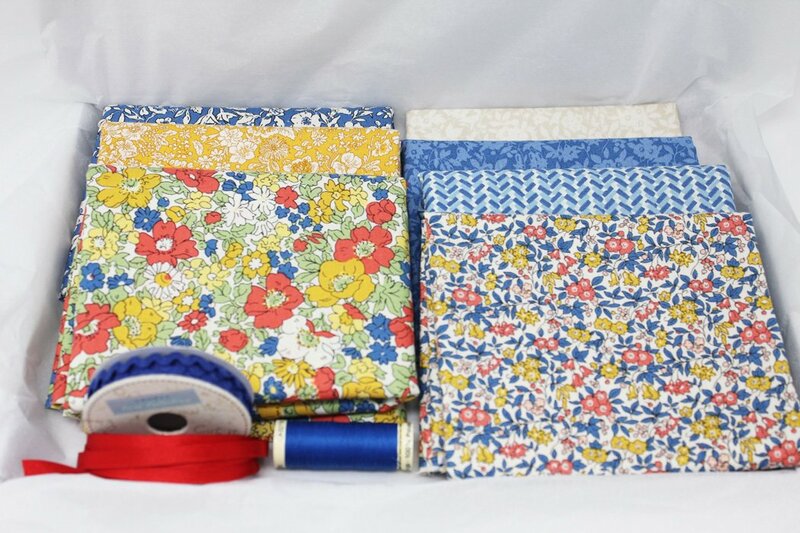 Available as a bundle or in yardage. Saturated colours and lots of geometric patterns. 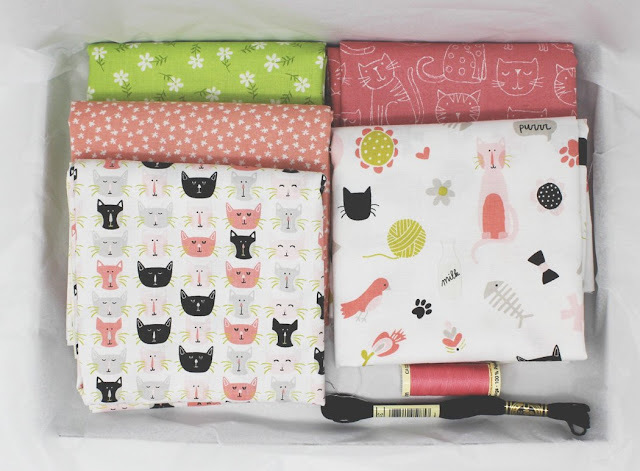 Dashwood Studio Life's Journey FQ Bundle. Designed by Joanne Cocker, I really like the subtle colour palette and the simple graphic print style. It is such a treat to be able to use amazing photos taken by a professional photographer for a pattern review! 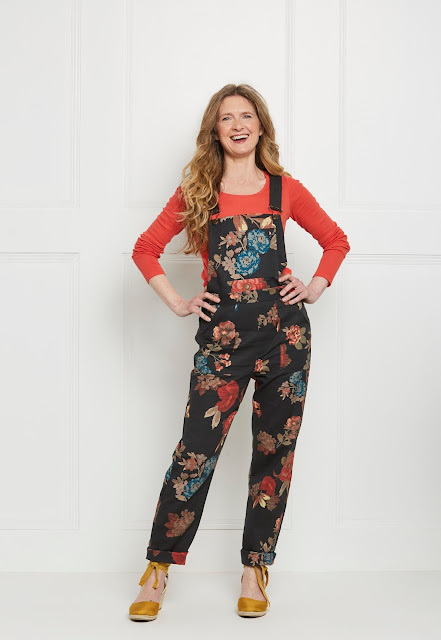 These dungarees were made as a Reader Review for Love Sewing magazine and I thought I'd share here how I got on sewing the pattern. Photos are by Renata Stonyte. 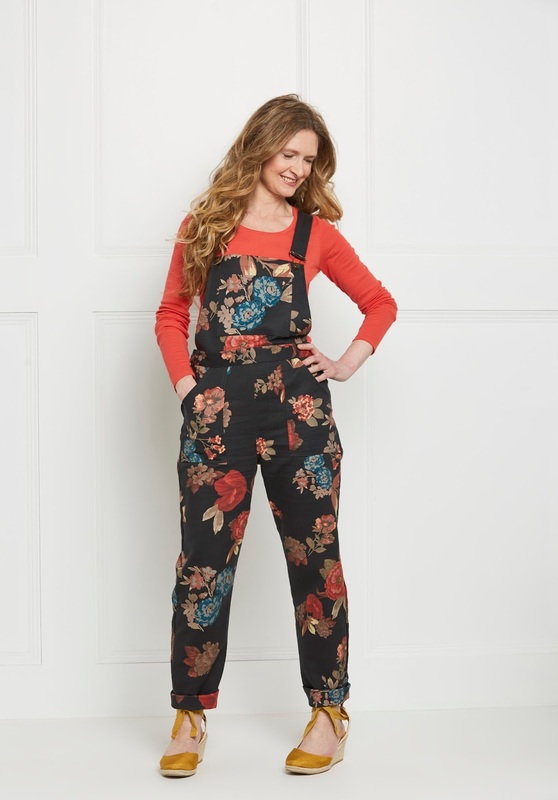 It's a jeans and overalls pattern with lots of potential for customised elements, two leg silhouettes are included and length variations. 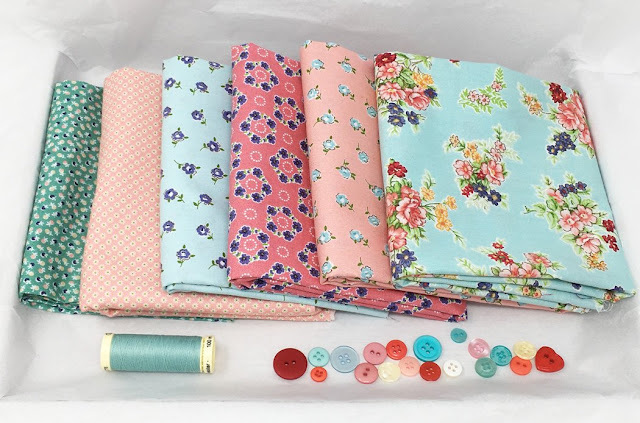 The fabric recommendations are for stretch wovens and I went with a stretch sateen as I wanted to wear these in Spring and I didn't want anything too bulky for the pockets and seams. Big florals are everywhere and although it's a bold print, the dark background felt a bit safer! Mine came from Josie at Fabric Godmother, this is a similar fabric, still available. 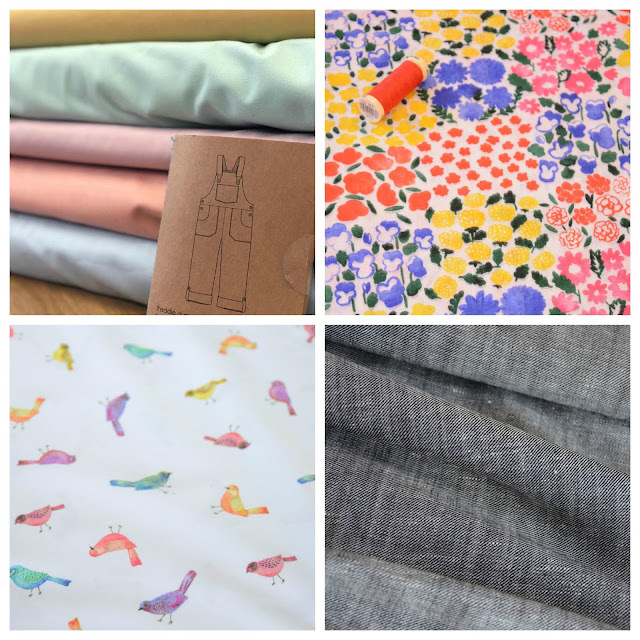 I did make up a tester to check fit out of some weird stretch cotton from my stash. It was worth doing. Unlike many big four patterns, this one doesn't have much ease, I ended up making a size 12 which matched my body measurement on the sizing info. There are a lot of marks to transfer so it's worth a double check before you unpin the tissue pieces from the fabric! I read some reviews before I started sewing - lots of sewing bloggers have made this pattern- and many people mentioned the short straps so I cut them a few inches longer. 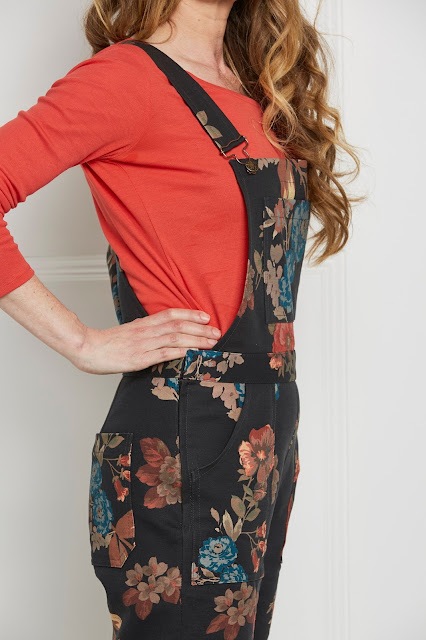 I also added 2 1/2" to the waistband length as the original style is fitted at the waist like a pair of close-fitting trousers- I wanted something more relaxed! I also straightened the legs from around the knee downwards, again for a relaxed feel. It's a systematic make: I batch stitched elements like the pockets- prepping them all together and then sewing the topstitching one after the other. I find it easier to get consistency with my settings this way. The pockets are all patch style and I basted each one to get accuracy and placement symmetry. The instructions are quite detailed but there's no guidance on when to finish your seams so I'd advise reading ahead and planning accordingly. Quilting tools often come in handy for dressmaking. I used a Hera Marker to crease all the pocket edges that needed turning before I pressed them. I also used Clover water pencils to transfer marks and a seam gauge to check placements, topstitching, hems- everything really! I added Liberty cotton lawn interlining to the front and back bibs to keep the fabric stable- no stretch is needed on these sections. I did find it a little fiddly getting my straps to meet perfectly on the back bib and had to narrow the top of the back bib to get the inner triangle facing and staps to fit neatly. Happily, I didn't need much in the way of fitting adjustments. The front low crotch was a bit saggy- no one wants that! So I reduced the top inner thigh seams a little and the sagginess was banished. The biggest change I made was to omit the ease stitching at the waist for a looser fit. I made sure all my pieces were centralised front and back when adding the waistband and it all worked out well. The waistband sits just above my high hip rather than the original high waist fit. Amy's version looks lovely in the dark denim. She sewed up the same size so you can see how the ankle taper in more on hers. Read her review here!. It's a satisfying pattern to sew and could be a good base for other stretch trouser shapes, can't wait to get some more wear out of these! Love Sewing Magazine: Issue 53, Bumper Edition! 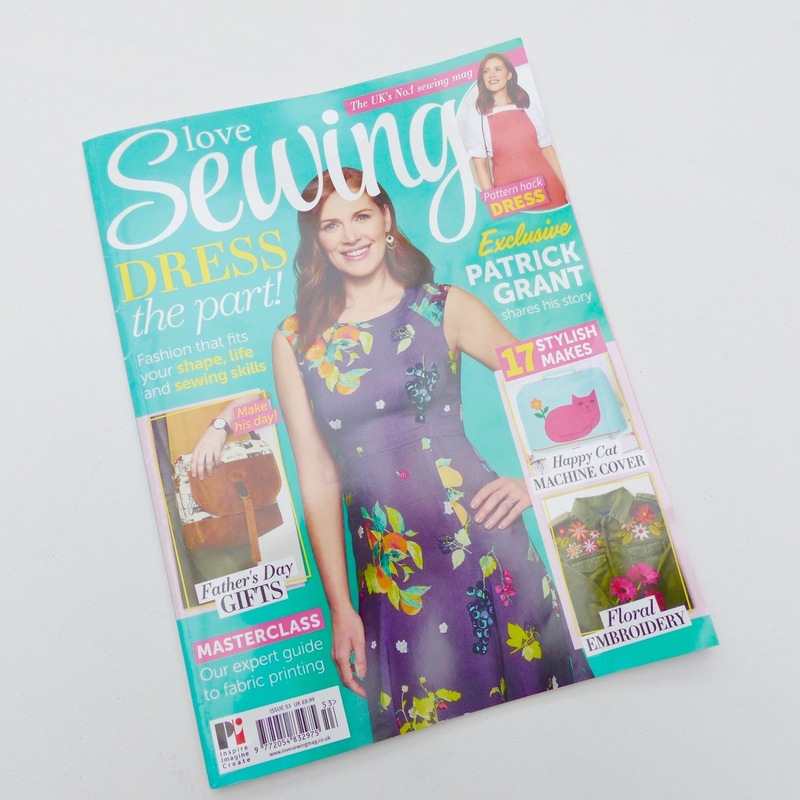 Every now and again a series of sewing related features and projects come together and this month's issue of Love Sewing Magazine (issue 53) is one of those moments for me. 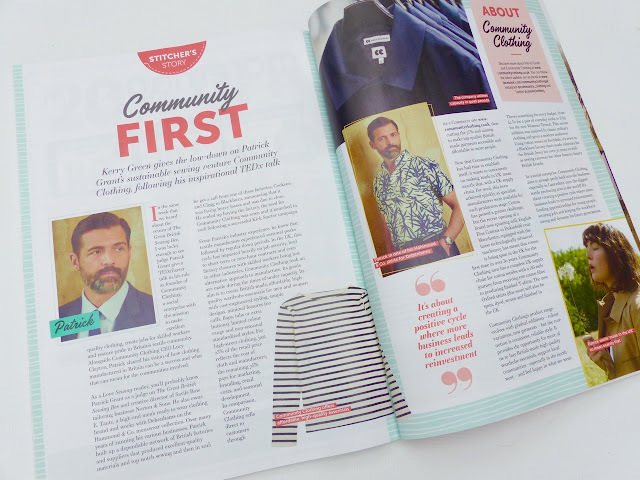 As well as my usual Swatch Selector column, I am the reader reviewer for one of the two free cover patterns and I wrote a two-page feature on Patrick Grant (of Sewing Bee fame) and his Community Clothing social enterprise initiative. Here I am with Amy, aka Love Sewing editor at the photo shoot. It was a really fun day at the Practical Publications photo studio in Stockport. I had my hair and makeup styled by Nina which was a first for me and I picked up some great tips- namely, a foundation brush has an amazing effect and that eyelash curlers are an essential item! Everyone was very friendly and welcoming. We had some sewing chat, plus lots of silliness and general fun. 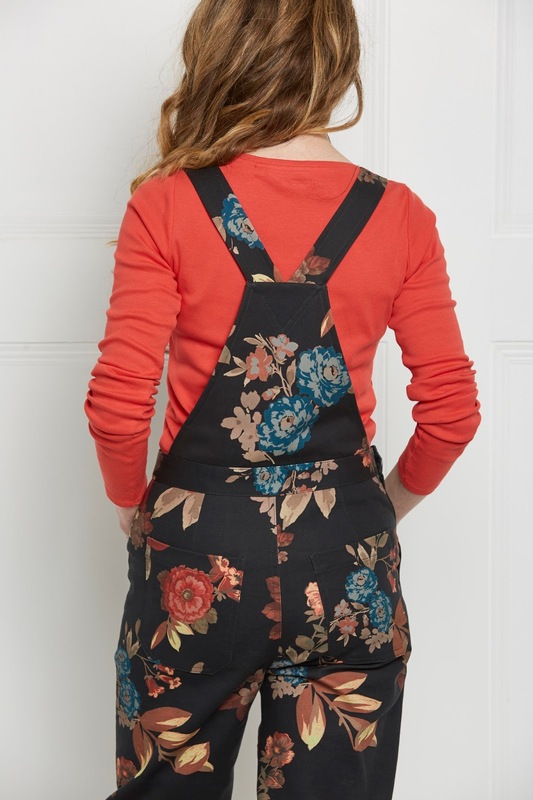 I reviewed McCalls M7547 and made the floral stretch dungarees that I'm wearing in the pics. 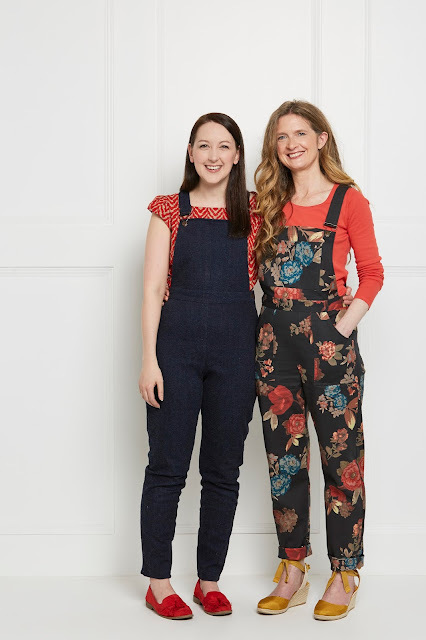 It's a great pattern as it also includes trousers and different leg styles- shorts, flared, tapered, and Amy has written an easy-to-follow dungaree/dress hack tutorial inside the magazine. You can read her blog review of M7547 here! 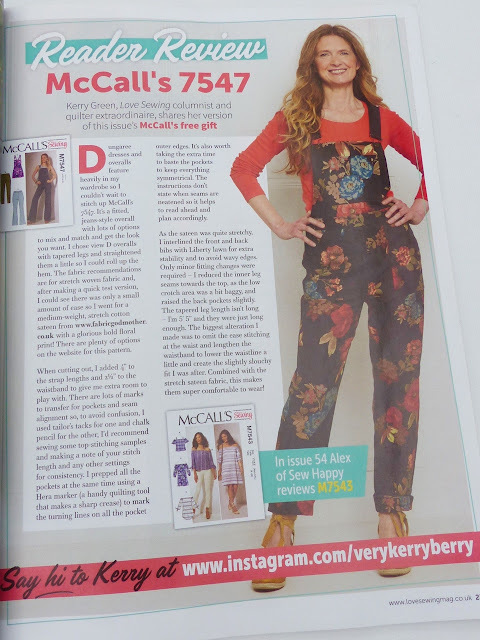 Here's my Reader Review page- I'll write up the review for sewing the dungarees for you here too...that's the post after this one! By some strange twist of fate, I got a chance to go to Patrick Grant's business workshop at Exeter University which was a preview, and more of his TedxExeter talk on Sustainability in the clothing industry. All credit to Patrick, he is really making a difference with Community Clothing and his goals of restoring pride, creating jobs and making great clothing. I bought the Breton top in the pic below from their e-commerce site, it's incredible quality and made in the UK. 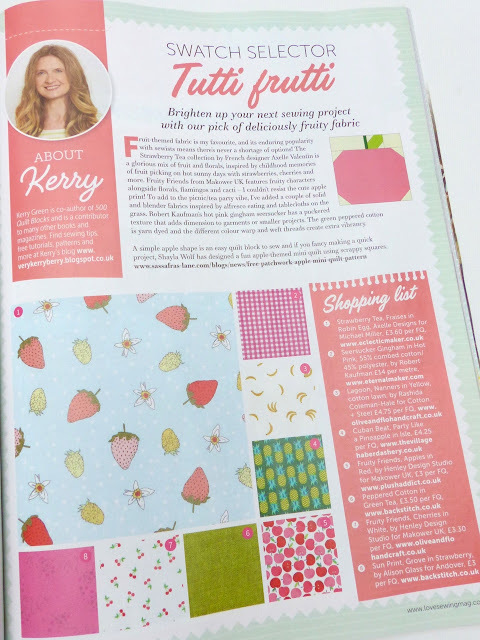 And as always, there's my Swatch Selector column, this month with a fruity theme. I've chosen a delicious selection of fabrics with a pretty mix of fruits, florals and picnic inspiration! It's a very special issue for me, I'm so proud to be a part of it! In the UK, you can find it at Asda, Morrisons, Sainsburys, Tescos and WHSmiths. In the US, it's available at Barnes and Noble but 40 days after the UK. Anyone can buy it and have it delivered at moremags.com. There's also a digital edition. I'm happy to feature a new sponsor here, My Sewing Box which is run by mother-and-daughter duo, Angela and Amy, from a small office in Dorset. I was in touch with them last year for a magazine feature and they kindly sent me one of their themed boxes- I made a quilt for Lottie! 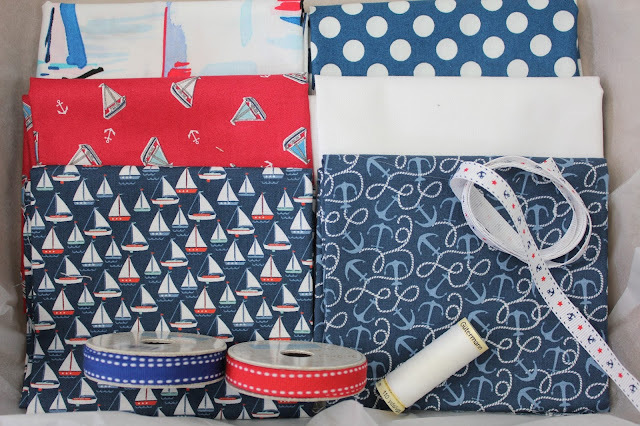 They are now expanding their business and have some very interesting plans, plus they still do their lovely boxes, so I'm going to share some of their story and show you around their online shop. 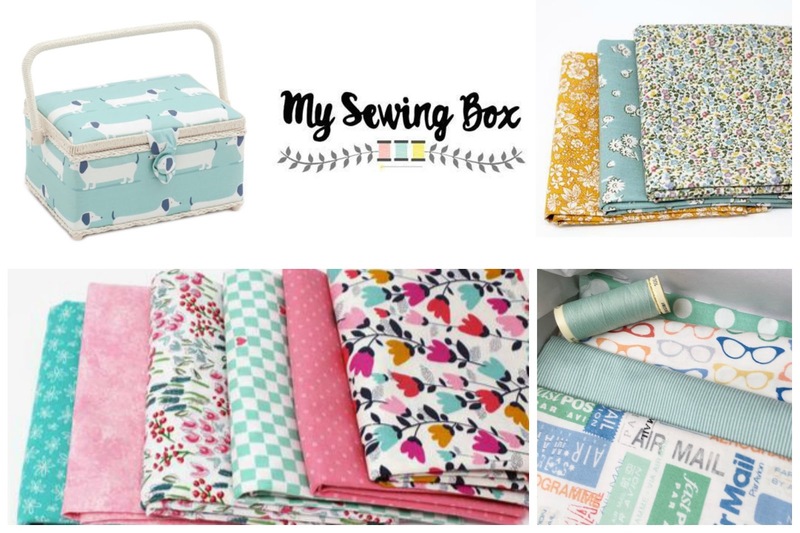 My Sewing Box was set up in 2014 as an online selling fabric for quilting and dressmaking, haberdashery, wadding, patterns, sewing notions and more. Angela and Amy like to source great quality, well designed fabrics and present them in boxes, fat quarter bundles and yardage. 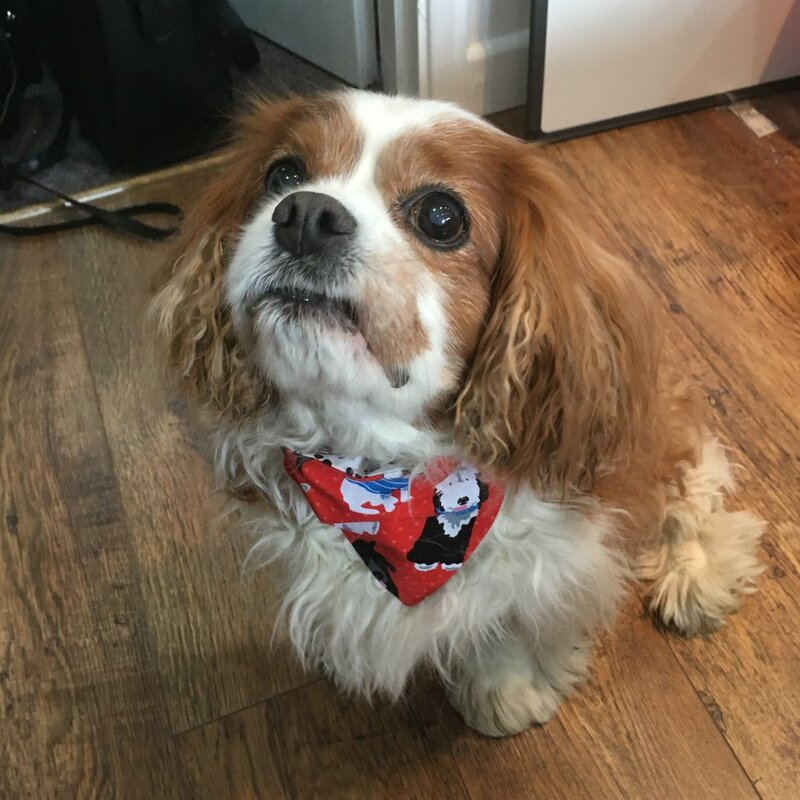 This year, Amy has left her usual full-time job to spend more time on the business. 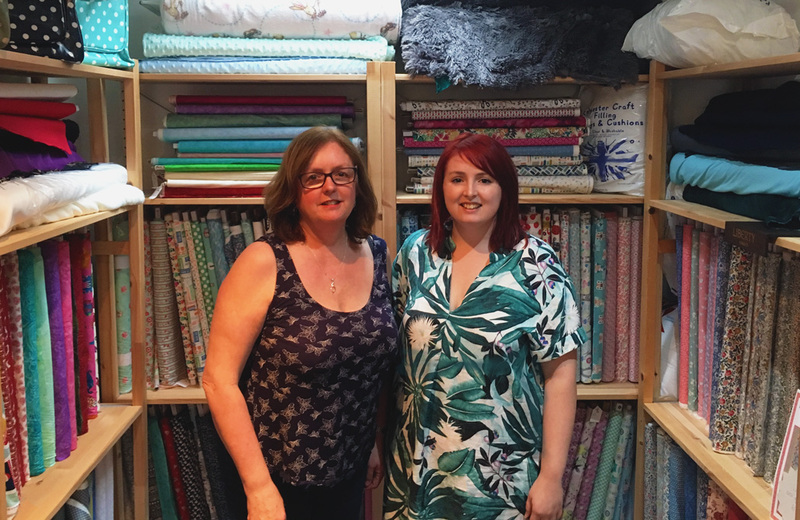 Together they cover everything from packing to putting together new boxes, hunting for new fabrics and products and sharing on social media. Subscription boxes are still their best selling product with sales overseas as well as the UK. There are one-off boxes too (perfect for gifts) and project boxes as well as lots of fat quarter selections. Anglea and Amy spend a long time planning future boxes and ensuring that all the contents offer enough variety for long-term subscribers. I really like the variety of scale in the different motifs and it's a classic red/white/blue palette. Love the fabric bottom right! 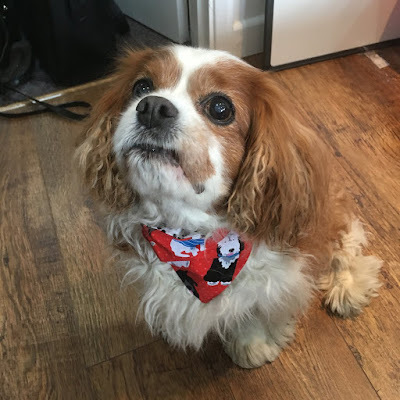 Dog Box- all the materials you need to make a (beautifully modelled) double-sided bandana. 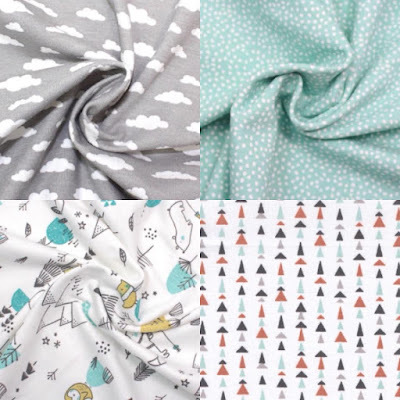 Other highlights for me include a rather lovely jersey selection these are all by Domotex and are especially suitable for childrenswear. There are also pontes and drapey jerseys for adult clothing - this is a viscose jersey in teal. 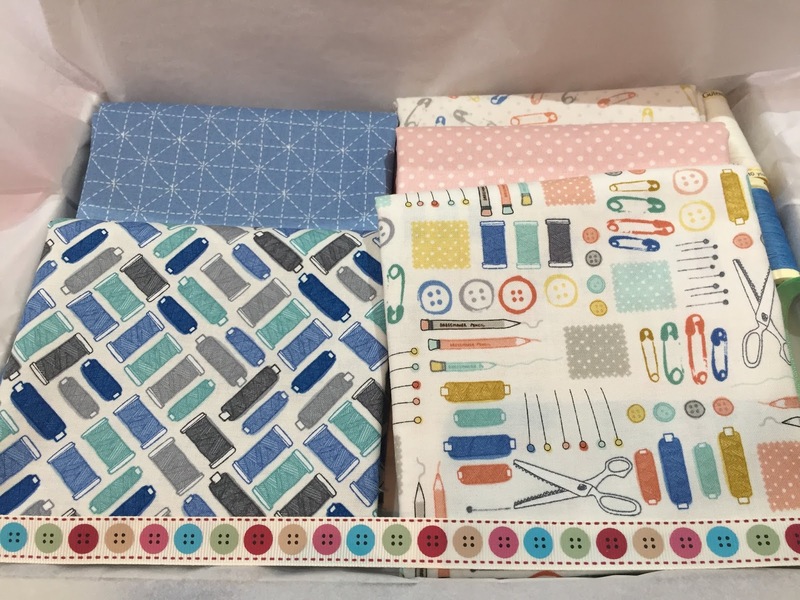 Plus, if you follow me and My sewing Box on Instagram, check my feed out over the weekend for details of a brilliant giveaway- a 3-month luxury box subscription! UK only for the giveaway- discount code is for everyone!